Sound absorbing foam - Eagle Foam - EA polyurethane foam. 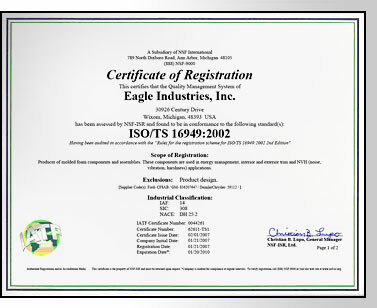 Quality Policy: Eagle Industries is dedicated to continually improving our processes enabling us to profitably meet the requirements of our customers while maintaining a safe workplace. These tasks are accomplished through increased communication, training, improved customer satisfaction, and the enhancement of our management system and technical areas.